Your new career begins with the Introductory Course before progressing to Stage One (Practical & Theoretical Certification) for professional qualification. 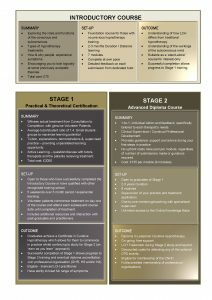 Graduates of Stage One will have the ability to treat a wide range of symptoms/conditions and can begin in practice with the backing of a professional organisation while they progress through Stage Two (Advanced Diploma) – refining, enhancing and extending their skills, understanding and abilities. Graduates of Stage Two will have a Diploma in Lesserian Curative Hypnotherapy, be eligible for full membership of professional organisations and become a licensed LCH therapist. Click the image below for a simple overview – more detailed information (syllabus, dates, enrolment, etc) are given on the relevant course page. There is NO requirement for additional courses to learn different techniques or methods for dealing with particular symptoms or groups of problems – everything required to provide LCH treatment for the whole range of conditions is incorporated within the above. However, regular Continued Professional Development is required for all professionals to keep them up-to-date with advances in understanding and/or application and to provide guidance and support, while some therapists wish to gain additional guidance or revision in specific areas. We therefore support our students/graduates with the provision of various opportunities for one-to-one Mentoring, personal Coaching, Continued Professional Development, regular conferences, online networking/discussion forum and practical training/workshops. Details of these and other resources for practising LCH therapists can be found on the Practitioner Resources page.